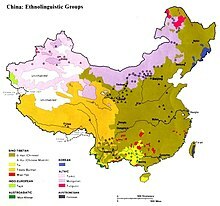 ↑ Who are the Chinese people? (Chinese). Huayuqiao.org. Retrieved on 26 April 2013. ↑ "World's Most Typical Person: Han Chinese Man". China Real Time. Wall Street Journal. 4 March 2011. Retrieved 23 July 2014. ↑ Jenner, W.J.F. (2004). "Race and history in China". In Alan Lawrance (ed.). China Since 1919: Revolution and Reform: a Sourcebook. Psychology Press. pp. 252–255. ISBN 978-0-415-25141-9. ↑ Millward, James A. (2007). Eurasian Crossroads: A History of Xinjiang. Columbia University Press. ISBN 978-0-231-13924-3.